Student Jenniffer Profitt is the first Preble Shawnee student to be accepted into an Ivy League university. She will be attending Columbia University this fall with a major in Astrophysics and concentration in Linguistics, Computer Science, or Applied Mathematics. CAMDEN — Student Jenniffer Profitt is the first Preble Shawnee Student to be accepted into an Ivy League university, according to Principal Dianna Whitis. Profitt will be attending Columbia University this fall with a major in Astrophysics and concentration in Linguistics, Computer Science, or Applied Mathematics. She will also be doing the Columbia Exchange Program with Juilliard and studying with the violin faculty. She will be auditioning for their orchestra in early September. Profitt spent the beginning of her high school career at Springboro, but moved to Preble Shawnee the end of her sophomore year. She is an avid musician, who was once in five orchestras at one time. She plays violin, guitar, piano, banjo, and chello. When she applied to Columbia, she actually submitted a music portfolio. She also submitted an arts portfolio, as she enjoys drawing and painting. She has a passion for languages and actually started the new German Club at Preble Shawnee, where she teaches the other students the language. German is not the only language she knows, as she also studies French, Spanish, Irish, Turkish, Uzbek, Dutch, Danish, Swedish, Norwegian, Welsh, Russian, and Esperanto. She also does roller derby and archery. She is involved in “political activism” against drug abuse, bullying, and other student health issues. Last year, she competed in a research competition at MIT where she presented her original research. Despite her impressive resume and interests, Profitt was not expecting to be accepted to Columbia. “Most people record their decision reactions, but I did not think I was getting in, so I didn’t even tell my dad it was happening. I was shocked and excited. When I told my dad, he was also really happy,” Profitt said. While she did get wait-listed at Harvard, even if she had been accepted, she would still attend Columbia this fall. “I’m interested in physics and in eighth grade I learned about quantum physics when I was watching a NOVA documentary with Brian Greene. He is a professor at Columbia now and I thought, ‘What if I could study under my favorite physicist?’ I got a fee waiver so I decided to apply. It was a last minute decision, but I did some research and saw they have the core curriculum and every student has to take different courses and I’m interested in different things,” Profitt said. On her acceptance letter, Profitt actually received a hand-written note from one of the admissions officers. It reads, “Welcome to Columbia Jenniffer! We were all wow’ed by you! Your intellect is as profound as you character is strong. You are a genuine star! 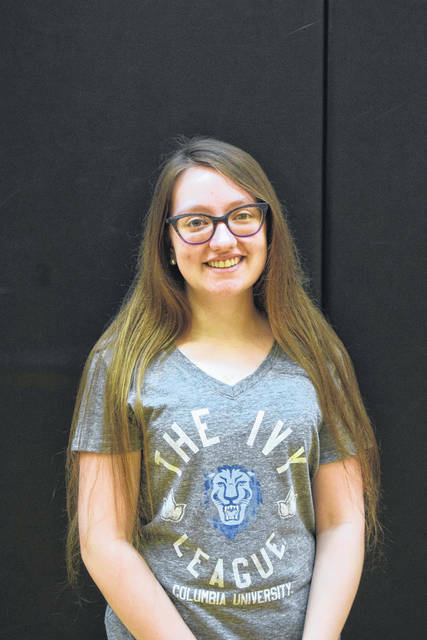 https://www.registerherald.com/wp-content/uploads/sites/41/2018/05/web1_PS.jpgStudent Jenniffer Profitt is the first Preble Shawnee student to be accepted into an Ivy League university. She will be attending Columbia University this fall with a major in Astrophysics and concentration in Linguistics, Computer Science, or Applied Mathematics.